It snowed again today. A lot (relatively speaking of course). We ventured out to Lidl today to buy some food so that I don’t have to go out and buy lunch next week at work. We usually order online from Asda, but all of the delivery slots were full. ALL of them until Dec 29th. Anyway, when we headed out, it was snowing. Not a lot. 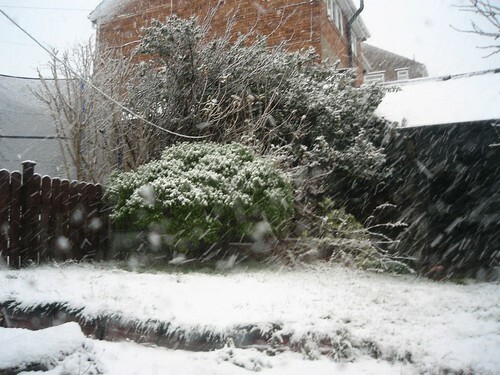 By the time we had gathered up what we went for and paid for it, the snow was coming down a bit heavier. A minute after we left the store, it really started coming at us. When we finally arrived home, I looked like a snowman in progress. The snow clung to my wool coat and my hair and lashes. O, on the other hand, just had a very wet face. People sometimes ask me where I consider home to be. I’ve moved around quite a bit. I didn’t always know how to answer. All of the places I’ve been have been great in their own way, but never really felt like home. There was something missing but I couldn’t put my finger on what it was. Nowadays I answer the question along the lines of wherever I want it to be. A few hours ago, I sat here on the couch knitting and watching the snow fall while Star Trek Voyager played on the TV. It was nice. Calming. I felt content. Snow in December with knitting on my lap is how it should be. I had put on a CD of Finnish Christmas songs to listen to while doing dishes and baking maple banana bread. While mixing the flour with the baking soda and baking powder, I happened to look out the kitchen window. More snow. I feel like I’ve found a bit more of home now.